I've been wondering what my life would be like if I didn't live in California? What if I didn't have access to bulk bins? How would my life be different? I grew up in the South, and I'm very aware of the lack of opportunities to make packageless purchases, and environmentally friendly options in general. Surprisingly, even in California, I still can't find everything I need in bulk. I probably could if I were willing to drive or travel almost 2-3 hours to get groceries. But, that's highly unsustainable. Who has time to do that? I also feel like traveling that much negates the positive impact of buying goods without packaging. If you don't have a farmers market, I hope your supermarkets sell produce loose or at least semi-loose like the picture above. When I have to make a packaged purchase, I ask myself a series of questions. I hope these questions will help you make good decisions! Question 1: Can I make this? Things like yogurt, hummus, tomato sauce, peanut butter, bread crumbs, stock, pesto, salad dressing, croutons, gravy, apple sauce, granola bars.... etc. Nine times out of ten, I can easily make it. I can make it faster than driving to the store, cheaper, and healthier. (two things I hate making: tortillas and tortilla chips.) Pro Tip: Go to your local Mexican Restaurant. They typically make it fresh in house. I go in with my cloth bags and fill up on tortillas and chips! Question 2: Can I buy it in a returnable bottle? Often times milk and yogurt come in glass. The bottles are collected at grocery stores and sent back to the farms. They also pay you for bringing your bottles back. Question 3: Can I buy it in compostable wrapping? A lot of baking supplies still come in paper bags like sugar and flour. Both of those are compostable. 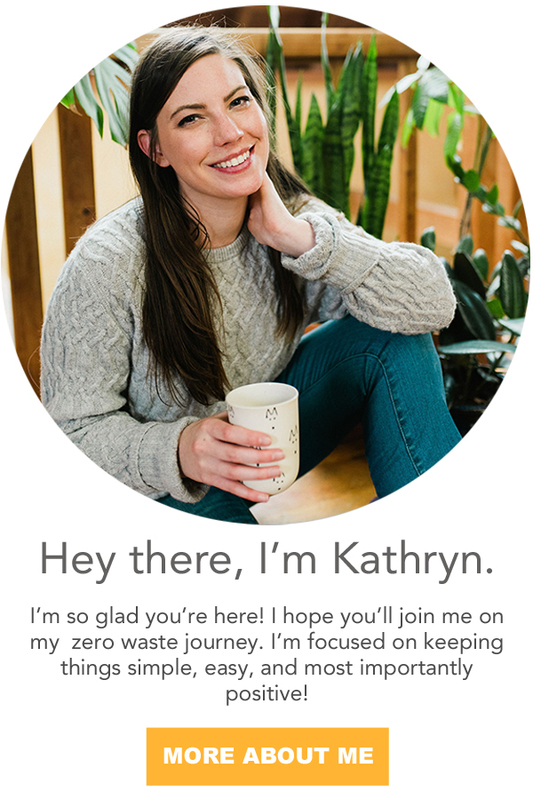 If you have municipal compost, put them in your bin. If you have a backyard compost, like me, I tear them in to small pieces. Place them in your pile or feed them to your worms! Viola - practically packageless. Question 4: Does it come in glass? Glass is always my number one go to. It's 100% recyclable. It is melted down to make new glass. Glass bottles I have in the house: Soy Sauce, Sesame Oil, and Buffalo Sauce. (If anyone finds Buffalo Sauce in bulk - CALL ME.) If you're not ready to delve into homemade mayo, salad dressing, marinara, wine, etc - glass is a great option. Question 5: Can I buy it loose in cardboard? This is becoming more and more rare. Manufacturers are starting to wrap the contents in plastic or paper and then put them in a cardboard box. But, occasionally somethings still come loose. Question 6: If it comes in plastic, what's the number? I don't know if you've noticed, all plastic has a recycle sign on it. It doesn't mean anything. The only thing that matters is the little number inside of the recycle sign. The higher the number the more likely it is to actually be downcycled. Most of the time plastic is just landfilled. PETE or PET (polyethylene terepthalate) most commonly used for cake trays, soft drinks, and pill bottles. Downcycled into carpet, furniture, and fleece. HDPE (high-density polyethylene) most commonly used for cleaning bottles, shampoo, milk jugs, and yogurt. Downcycled into fencing, floor tiles, and park benches. PVC (vinyl) used for cooking oil, clear food packaging, mouthwash bottles. Downcycled into roadway gutters and cables. LDPE (Low-density polyethylene) used for bread bags, shopping bags, carpet, clothing, furniture. Downcycled into ??? PP (polypropylene) used for cheese containers, syrup bottles, drinking straws. Downcycled into???? PS (polystyrene) AKA styrofoam used in take away cups, plates, and egg cartons. *known carcinogen; high rate of leaching into food* Landfill only. Researching each type of plastic, almost everyone said: avoid. I have to say I agree with them. But, sometimes plastic free options aren't available. Go by number. Avoid reusing the plastic containers and recycle if possible. Check your cities curbside collection to see exactly what they pick up. Question 7: Buy it in Bulk? If you run into any problems with what's mentioned above, and you can freeze it or it won't go bad on the shelf buy as large a pack as you can. You'll be getting bulk discounts and drastically reducing your waste. We bought a 25lb bag of rice when we first moved to California that lasted two years. That alone saved 25 plastic wrapped rice bags! And, never buy single use yogurt cups, chip bags, individually packed sweets, etc. Always try to buy as big as possible, if it won't spoil. You can freeze yogurt, cheese, bread, marinara, salsa, fruit, vegetables, etc. Even at the end of the day if you're left with lots of packaging from food, remember there are so many other places you can make an impact. Bringing your own to-go container to the restaurant, making cleaning supplies, making beauty products, carpooling more, buying experiences, buying second hand. There's still so much you can do. Don't be afraid to email your grocer asking for what you want. You're the consumer. They're there to serve your needs. Don't knock you're consuming power. And, if you really, really wanted, get together with some friends and open a co-op in your garage. You wouldn't necessarily have to sell to other people, but you could split the large shipments among yourself. It's all about making smarter choices! Has anyone else struggled with this? Do you live in an area with out bulk bins? How have you overcome this? Have you ever called your grocer?